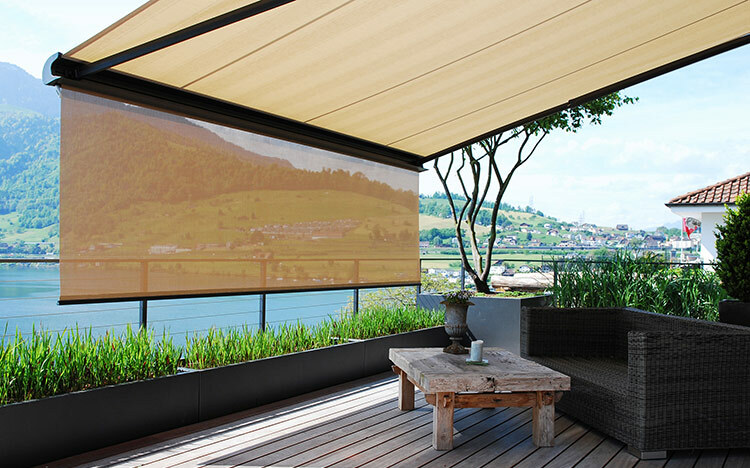 Elegantly housed sun protection for small to very large areas of shade. STOBAG cassette awnings provide convenient sun protection out of a secure box. Cassette awnings are particularly well-protected folding or telescopic arm awnings which can be fitted on the wall, to the ceiling or to a rafter. When the awning is rolled up the elegant and corrosion-resistant aluminium box effectively protects the cover and the mechanical components against environmental influences as well as rain, snow, storms and dirt. That has a positive effect on the service life of the awning and ensures worry-free enjoyment in the shade. Depending on the model, the awning can be operated by a crank or an optional electric motor. Several variations of remote controls and controls with sun and wind sensors are available for automation. When the sun is low in the sky in spring or autumn, the practical drop down valance provides excellent protection. This awning can be rolled out according to your needs, thus protecting your private space. Alongside waterproof acrylic fabric, a lightly perforated fabric can also be used to provide a greater "sense of freedom". The box is available in a choice of square or rounded designs. The clear, crisp lines of the design blend in harmoniously with the surrounding architecture and are also an impressive additional design feature. Fabric and mechanisms packaged in a cubic design. The cubic cassette for modern, Angular architecture. STOBAG's very own telescopic arm technology provides for constantly taut fabric. The rounded drop down valance gives you protection from the setting sun and from prying eyes.